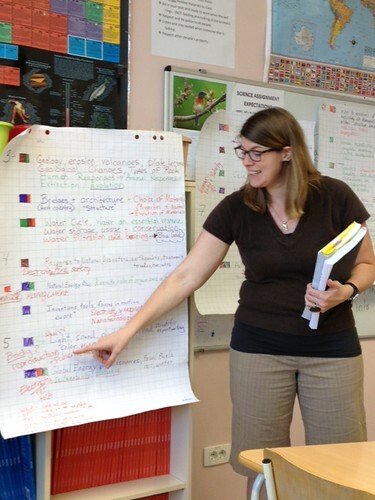 Head of Science Janice Medenica makes some changes to the science units. In discussing our units in the lens of the four science disciplines (Earth/Chemistry/Physics/Biology) we made several changes to our units. 1) We were concerned of when the Human Sexuality and Reproduction unit is taught. We currently teach puberty in grade 5 and everything else in Grade 8. We changed it by adding a more extensive Human Body unit in Grade 6 and keeping more of the Human Sexuality aspects in Grade 8. 2) Stewardship of the Earth should be a focus on every year. We went through the Reduce/Recycle/Reuse and global warming/climate change focus for each grade level. 3) We also made some specific unit moves, like moving general ecology unit from grade 7 to grade 10 as an addition to the cellular respiration and photosynthesis unit. Simple machines are covered in Grade 4 so do not have to be done in Grade 6. We swapped Electricity/Magnetism in grade 9 with Evolution in Grade 8. We take alternative energy out of Grade 9 and into Grade 10. In the PYP we added Electricity and Fire Safety and Waste Management to Grade 4. To help understand Rube Goldberg Machine unit, we added magnets, nanotechnology, and work. We moved Newton’s Laws from Grade 6 and put into Grade 5, taking out Light and Sound and the Scientific Method. We also added “Then and Now” to Grade 1 and made three science units for the new PK-3 class. After we completed re-arranging the units we put forth a plan for 2013-2014. The three priorities will be to look at the skills of science and when and to what extent they are taught at each grade level and comparing our Curriculum Overview Map with the National Science Digital Library (NSDL) science literacy maps. This will get us some conceptual balance. Finally, are the PYP Science Strands and the MYP Concepts enough substance for our curriculum or do we need another curriculum tool.